We all know that print media is hemorrhaging readers and subscribers – faster than they know what to do with. Not only readers and subscribers though – advertisers have been shifting their ad dollars online… you know, where all the traffic is! But there might be a knight in shining armor that is on the way to save the entire print industry, and its name is iPad. That’s right, Apple’s “magical iPad” might be just what the doctor ordered to not only stop the hemorrhaging from print media, but actually turn the industry around and make it profitable. According to a recent Nielsen Company survey of 5,000 iPad, iPhone, and other smartphone owners, 91% have downloaded apps onto their devices. 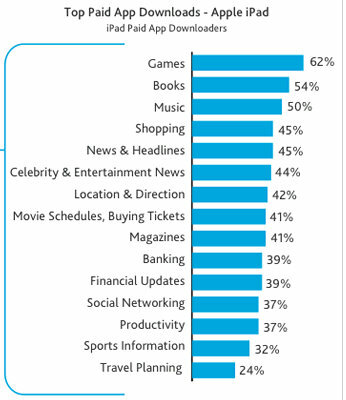 Notice that 41% of iPad app downloaders are paying for magazine apps – 44% are paying for celebrity & entertainment news – and 45% are paying for news and headlines. That’s people “paying” for these apps! So forgive me if I’m wrong here, but it seems that iPad owners are willing to spend money for the content they used to get via printed channels. Obviously, the iPad is a large enough screen to make it enjoyable to read content and mobile enough to get the latest content on the go. So these are the factors I believe could contribute to the turn around – or the saving of – the print industry. Now the question is, will the printed media actually embrace the new age of the iPad, and the slew of Android tablets that are on the way?